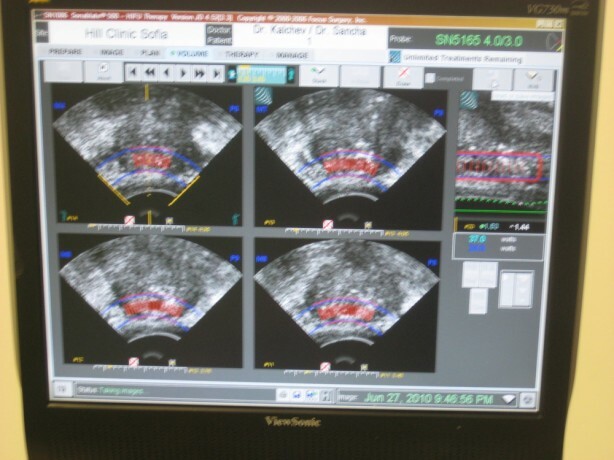 The HIFU procedure (High-Intensity Focused Ultrasound Therapy) is the most modern technology for prostate carcinoma treatment. Using focused ultrasound energy only cancerous tissue is destroyed with no incident of injury to the surrounding tissue. 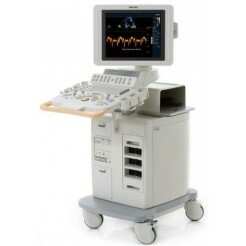 The ultrasound is focused (focal point), the sudden and intense absorption of the ultrasound beam quickly raises the temperature up to 70-100° for less than a second. The area destroyed by each beam is very small and precise. HIFU – technique allows physicians to treat and monitor treatment at the same time. They aim the prostate tumor and destroy it with a beam of High-Intensity Ultrasoundenergywithout damaging the surrounding tissue. HIFU energy targets tissue in the prostate in the same way that sunlight focuses by a magnifying glass. When a magnifying glass is held above a leaf, the sun’s rays intersect beyond the lens and cause the leaf to burn at the point of intersection. The recovery time after a HIFU treatment is considerably shorter than in other types of treatment as radical prostatectomy. Most often patient are back to their normal daily activities immediately after the procedure that lasts 2-3 hours. For the first time HIFU allows only the affected area to be treated without damaging the surrounding tissue, nerves, vessels and organs. In cases of a more complex condition of the patient the bloodless and minimum invasive therapy can be combined successfully with the GreenLight technology.